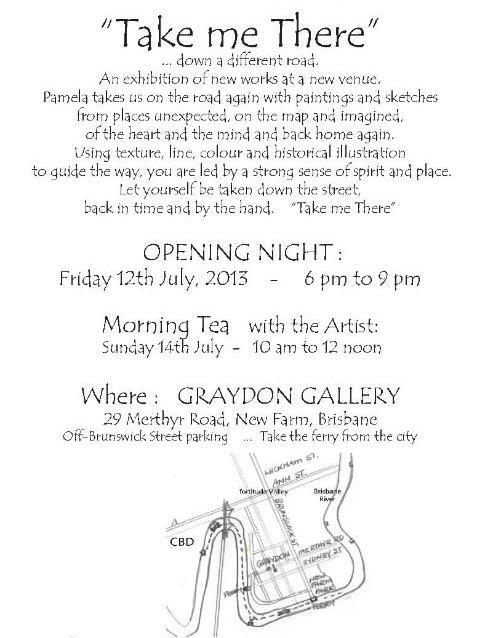 ... a selection of new and retrospective landscapes, from Brisbane and places that captured my heart and soul . 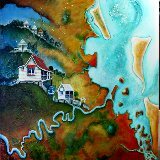 TATTERSALL'S annual Exhibition 2017 - "OUTBACK to REDLANDS ON THE BAY" SOLD and This Painting image has been adopted by the MORETON BAY FOUNDATION. 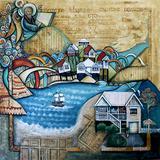 CENTENARY of PADDINGTON KINDERGARTEN Commission - ........ "100 Years of Rainbows"
"HOME AND THE THOUGHT OF KELLS" makes the finalist list for this notable Art Prize. .This piece addresses "we came by boat" and the fact that unless we are Aboriginal, our heritage is from overseas, somewhere else on the planet. 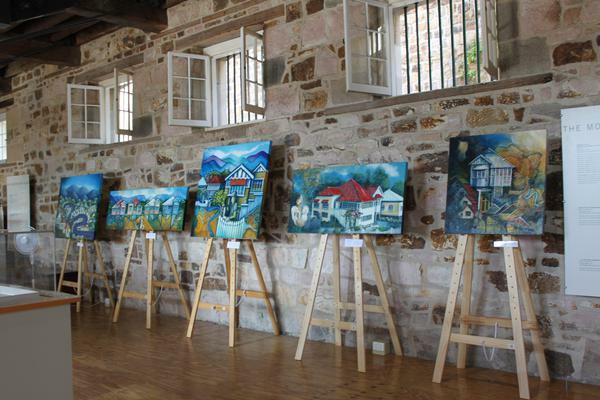 Pamela has been invted to exhibit and be the Guest Artist, exhibiting and displaying a selection of her favourite historical Brisbane paintings. 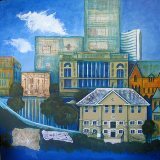 This exhibition of new paintings and sketches was inspired by a journey back to her family origins exploring the Celtic and medieval influences in her work. Many Australian homes and family stories, however, draw upon their origins and traditions from distant lands ... across the seas.Pamela finds connections to familiar symbols which are carved in stone and painted on centuries old plaster in other places and countries. 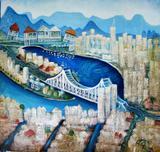 TATTERSALLS annual LANDSCAPE Exhibition "150 years Queensland"
Waterfront Place, Eagle St, Bris. 3 - 18 September. The piece this year is a charcoal sketch of our River Brisbane with the landmarks as described by Lt. Stirling in 1823 when Oxley chartered a course . 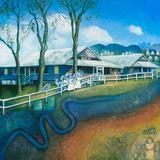 Since Brisbane was established as a convict/penal colony many have come from across the seas to our shores by boat celtic lands to make this Aboriginal place our home..
"Charting a course to our Town"
Officially opened by Bernie Hollett, curator of Tattersalls Landscape Art Prize ... An exhibition of new works. Tales from wise old Houses, young whimsical Renovators and retiring old Queenslanders, ... about Hills Hoists, fence palings and mango trees ... all in my backyard. 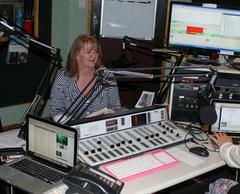 4MBS (103.7 FM) RADIO INTERVIEW with Howard Ainsworth Sat 28 June. 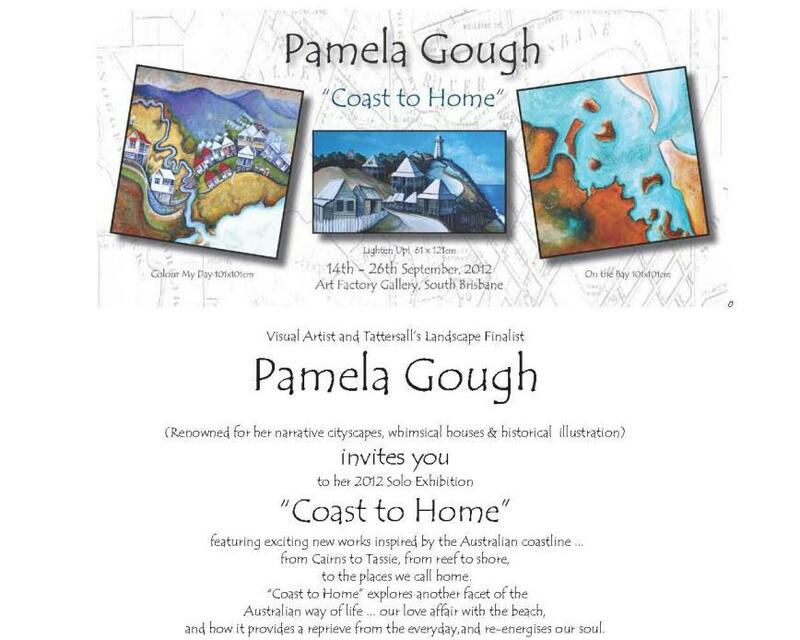 2013 EXHIBITION - solo - "TAKE ME THERE"
2012 SOLO EXHIBITION - "COAST TO HOME"